Thank you Praveen. This issue is quite complex and widespread.. all the way to NE india. Each of these stories you write brings tears to my eyes….we encroach the wild land and when the wild hits us back, they need to back….but never us backing off…..nevertheless, great writing Kalyan….your compassion is remarkable. You truly are my hero and inspiration!!! Thank you Rudra for the kind words. But when you say us, it has to be literally you and me. Not the villagers and forest dept. Super excellent. Hats off to you for chronicling this and giving us this poignant glimpse. Lovely narration and pics Kalyan! Sharing widely as people need to know how intelligent, complex and caring other life forms can be as well.. Thanks Sandeep. We have so much more to learn from elephants. Returning fresh from a site where a tusker which was electrocuted, this piece is some reminder of the fate that ‘development’ takes us all. Lovely portrayal of the elephants empathy, the stories which are the domain of the mahouts, kavadis and the Forest Department. Pragmatic decisions on the field are taken under such circumstances are taken by officers in the field. On hindsight people and expert cringe on decisions taken. Conservation is certainly not for the fragile or faint hearted, one needs to grow a thick skin as well. I really feel for the field staff of the forest department. One call and the villagers will go after them, an opposite call and urban conservationists go after them and if they do nothing, then the politicians go after them. Very interesting write-up kalyan.. Very few are able to understand and articulate the animal perspective in the incident. More efforts should be made to make people understand that elephants are one large family and are well connected. Your first hand experience with supporting photographs is evidence to this fact which no one can deny. Lovely piece of writing ! Nice photos to tell the story as well..
Really heartwarming to know about the emotional ability of the elephants !! Simply incredible, Kalyan. What amazing animals – their patience, stoicism, compassion in the face of such trial and trauma. You also brought out the realities of the difficulties in the field for the FD staff and others. Enjoyed every bit of peep into the lives of this gigantic animal through your eyes and words. Wonderful narratives and a salute to the team that displays so much of presence of mind in times of crisis. Everyone who love elephants should read this. Thank you for such a wonderful narration. Almost as if an elephant was telling the story. It was a most touching account of the empathy and bond these mighty creatures share. There’s just so much to learn from them. It also throws open all the issues and conflict with humans our wildlife is facing, not the mention the very tough job the forest department has in it’s hands. It was a totally captivating read, with such evocative pictures. Thank you. Thank you for writing this. Was very moved while reading it. It is very touching story and you have captured its essence very well. Thank you for bringing this issue to light! Most of the world is oblivious to important wildlife conservation challenges and articles such as this will go a long way in bringing awareness and hopefully appropriate action. Photo-journalism is an integral part of conservation and you have done such a fantastic job of it! Kudos! Working in wildlife conservation myself, every time the department sets out to capture ‘conflict’ elephants, it tears me apart. While the capture is brutal enough, the ‘training’ after that is quite literally breaking the poor animal’s spirit and sucking out its soul. With encroachments into forest land and crucial corridors happening every day, we will only see more of these captures sadly, unless something is done about it. We need to make the fight of a few people, the fight of millions and work such as this will definitely help. Keep up the good work! Hi Kalyan… a very well written post. But I have a question here… what is the need to hold them captive. Can’t these captive elephants be released in a different location. They deserve to live in the wild. Don’t they? Great work and writing/documenting . i am getting emotional as well as curious more than about the Games of Thrones series . I am in tears.. Just imagining how beautiful the elephant world is.. How little we know of them.. Thanks for sharing their beautiful world.. Such a beautiful article! Thanks for sharing this..i would love to read more about them..we use drones for all nonsense activities, where as if we had small drones to help trackers,then it would make locating herds and reuniting easier.I’m planning to work in this as a hobby project..
Merci pour cet article extrêmement émouvant. Si seulement, les gens connaissaient mieux le monde des éléphants, je suis sûre que beaucoup de choses changeraient. Beautiful photography and narration ! Wow what an amazing narration of events. You have explained the complexity of the situation with such ease and gentleness. Kudos to the efforts. 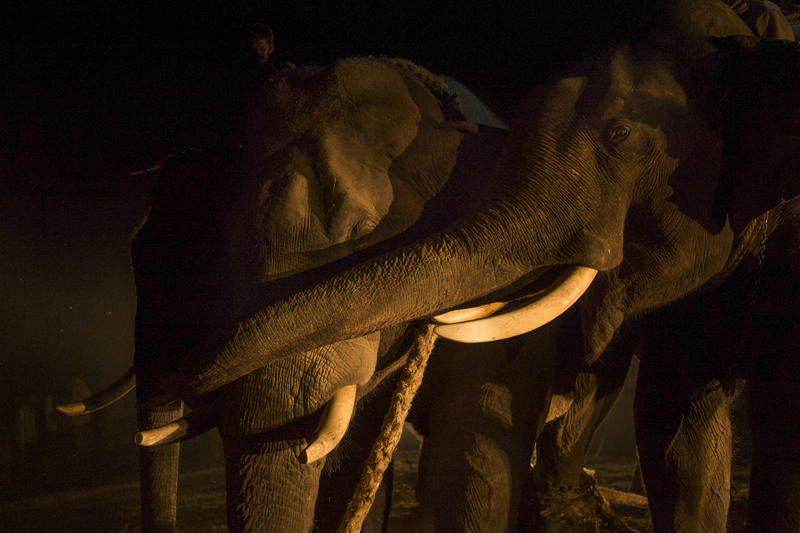 I hope these captured elephants were taken care of. Please open a Facebook page so we can get an update regarding wild elephants. In a Jam packed train… Yet reading this makes one feel so lonely n small with an elephant size lump stuck in the throat!! Thanks for taking up this matter and chronicling the same so comprehensively – MORE POWER TO YOU AND PEEPLI!!! Best wishes…. This article brought tears to my eyes.I understand the local sentiment and why the capture was necessary. Yet, it is such a sad thing to take and break free and proud creatures. The empathy and behavior of the elephants was quite an eye opener for me. applaus for maintaining the focus on the jumbos not letting the narration deviate even a bit. I am sure ur job and others involved in this must be really really tough. But with Ur narration I can vouch that u loved that risk involved in ur job.I just could see beautiful friendship between the captive and the kumki. Kudos. Book marking ur page right away. Abhimanyu just stole the heart a true hero. the empathy between the tame and the wild elephants is an eye-opener. there have been reports of tame female elephants decoying wild males thro mating strategies. i feel that the report told us more about the veteran “mahouts”. i guess they belong to the Kadu Kuruba Sch. Tribe. they are the best mahouts in S. India. they live among and love the elephants. Anthropologist LAK Iyer described how they behaved when confronted with hostile tuskers. they were the unsung heroes of the Keddah operations of yore.